Galapagos is one of the most exciting destinations in the world. Guests will have the opportunity to dive with playful Sea Lions, travel to the famous Darwin and Wolf Islands for thrilling diving to see Hammerhead Sharks, Whale Sharks, clouds of Tuna and much more on their Galapagos Islands liveaboard scuba diving trip. Diving in the Galapagos allows divers to see a wide variety of underwater life and experience the sea's world. As with the animals residing on the land, the species living underwater have also not learned to fear people which makes them interested in what you are doing under the water. The underwater ecosystem is varied. You might very well get to see sea lions and dolphins, as well as sea turtles and marine iguanas under the surface. There are also a massive variety of sharks to be spotted. These include the Galapagos shark, white-tipped reef sharks, blacktip sharks and whale sharks.Hammerhead sharks can also be seen with some frequency, especially at dive sites near Wolf and Darwin. You can also expect to see various varieties of rays including manta rays, or more likely, eagle rays. As well as these species, there are also a very wide variety of colorful fish and commonly spotted types include water jacks, grunts, barracuda, snappers and groupers. Also seen sometimes include bloody frogfish, rainbow basslet and Galapagos clingfish, among many, many others. The underwater world is also home to starfish, crabs, and even seahorses for divers that are lucky enough to spot them. The waters of the Galapagos Islands are a unique mixture of warm and cold water, ranging between 65°F and 85°F, with thermoclines about 65°F. We recommend you bring a 5mm-7mm wet suit with hood and gloves or a dry suit with light underwear all year round. The cruises to some of the islands can be rough and we recommend you take precautions against motion sickness. See the “Captain’s Log” on the Galapagos page, www.aggressor.com, for current diving conditions. The diving in Galapagos can be strenuous, due to its currents and surge, varying water temperatures, limited visibility, and diving from dinghies. The crew of the Galapagos Aggressor III, with their unique combination of talents, offers the ultimate in service. While onboard you may pick a buddy of your choice or dive with one of the yachts crew-members. There is ample storage space for your diving equipment in your personal locker. The Galapagos Aggressor III provides 80 cubic feet tanks, weight belts, and weights. All tanks have K-valves (American type), no DIN (European) valves. Nitrox is available for an additional fee. They suggest you pack the following: mask, fins, snorkel, regulator with visible pressure gauge, depth gauge, dive computer, buoyancy compensator, light for night diving, batteries and dive gloves. Strongly recommended: Spare mask, safety sausage, whistle, Dive Alert, mirror and/or other safety devices. Dive computers are mandatory for each guest. Each piece of gear should be marked with waterproof paint or tape. You’ve chosen a LiveAboard vacation for the diving freedom that it offers. While in the water, you and your buddy are in charge. Every dive starts with a dive briefing from our staff. However, as a certified diver, you and your buddy are responsible for planning and conducting your own dives within the limitations set forth by the briefing. The staff will be on the dive deck providing surface support for divers. We will also have staff in the water offering support, u/w photography and videography, and critter spotting services as well. On some dive sites a staff member will offer to lead a group and assist them in locating specific points of interest. However the yacht does not offer direct supervision of dives. If you start out with a group, as long as you and your buddy remain in contact with each other and are ok – you may follow your own dive plan. The Galapagos Aggressor III is 100 feet long, built and powered for comfort, safety and stability. She is diesel powered, cruises at an average speed of 10 knots and has 110 and 220 volt power onboard. Comfortable accommodations include four deluxe staterooms which have two twin beds and three portholes and six master staterooms with a queen bed (which can be modified to 2 twin beds) and a large window. Each cabin has a private toilet, shower, hair dryer, TV/Blue Ray DVD, stereo CD player, temperature controls and safe storage box. The Galapagos Aggressor III sleeps 16 guests in privacy and comfort.The Galapagos Aggressor III has a beautiful spacious salon, large sun deck with shading, chaise lounges and deckchairs, bar, grill, hot tub, and a complete photo/video center. The menu aboard is varied and plentiful, with a variety of American feasts, barbecues and local cuisine. If you have any special dietary requirements, please add this to your reservation and speak to the yacht chef once onboard so he/she can adequately prepare to meet your needs. You will wake up to fresh fruits, hot entrees, cereals and juices. Lunches are buffet-style, featuring hot soups, homemade breads, salads and sandwiches and/or entrees. Dinners are chef prepared and served each evening and include salads, vegetables, seafood, beef or chicken with a fresh homemade dessert. Certain special dietary and beverage requests may not be available due to the elimination of single use plastic and the remote nature of the location in the Galapagos Islands. We highly recommend you bring these items with you. The Aggressor’s selection includes fruit juices, soft drinks, iced water, iced tea, coffee, and a limited selection of local beer and wine, which are complimentary. Due to the high duty charged on liquor, we suggest you bring your favorite brand. Drinking and diving do not mix. Once you consume alcohol, you become a snorkeler until the next day. Diet coke is not available in Galapagos due to the elimination of single use plastic. Thurs: Baltra Airport, Afternoon Greeting by Crew, Bus Transfer to the Itabaca Channel Canal and Boarding. Welcome, and Orientation Dive at Punta Carrion at Itabaca Channel. Fri: 2 Morning dives; Punta Carrion (Santa Cruz Island) or Bartolome Punta. 1 afternoon hike to Bartolome Summit and panga ride at Pinacle Rock. Sat: 2 morning dives, 1 afternoon and 1 night dive. Sun: 2 morning dives and 2 afternoon dives at Darwin. Mon: 2 morning dives at Darwin; and 2 afternoon dives at Wolf. Wed: 1 morning dive at Cousins Rock. Wednesday afternoon arrive at Itabaca Channel or Puerto Ayora. After lunch guests will disembark at 1 pm to go ashore for a private bus tour to see the beautiful Highlands of Santa Cruz Island. This will include a scenic view over Santa Cruz and a Tortoise Reserve to see giant tortoises. After the hike, guests can walk through town, shop and visit the tortoise-breeding center Fausto Llerena at the Charles Darwin Research Station. Guests will have dinner ashore at a local restaurant of their choice (only meal not included in the cruise). 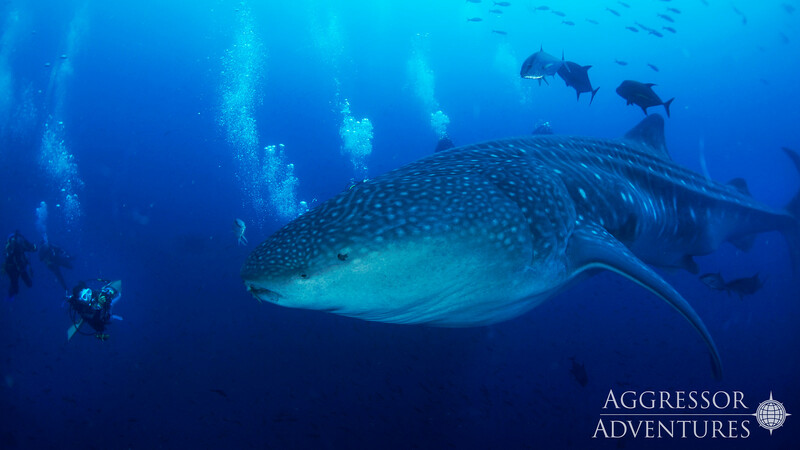 The GALAPAGOS AGGRESSOR® will depart at 10 pm from Puerto Ayora town to Baltra. Those wanting to continue their trip to for the optional land tour will fly into Guayaquil & then Lima. We haven't planned out this part of the trip yet but we will include sites such as the City Sightseeing Tour including the Cathedral, Monastery & the Plaza Mayor, Shop for Souvenirs in Bohemian Barranco, touring the Huaca Pucllana. If you have things you would like to do or places you want included please let us know. Guests may be required to show proof of health insurance upon arrival. This is a new regulation. Onboard fees and charges may be paid in cash, or MC/Visa credit card. Cancel after January 20th, 2020: $1,400 is forfeited. Cancel after April 24th, 2020: $2,800 is forfeited.